This article originally appeared in ZeroHedge. At a time when Spain is back in the limelight on account of its ever-sprouting corruption scandals, the government is trying to switch public attention to the prospect of impending economic recovery. Although some may find the minister’s statement a rather cynic proposition considering the reality on the streets, there seems to be a growing readiness to embrace the government’s optimistic message. 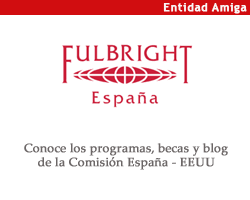 Before uncorking the cava, however, let’s take a look at the arguments put forth by the Spanish government to announce that the country is finally leaving the crisis behind. 76,000 people have left the labor market (i.e., retirees, people who have stopped looking for work and emigrants). Over the past year, some 500,000 people have been ejected from the active population census. 149,000 people have found jobs. A good number, only the context is not as good since the full sentence should read: 107,400 men and 41,700 women found temporary and precarious jobs, of which 60% percent were temporary contracts. 50,000 permanent contracts were lost in Q2 –over 430,000 YoY. Long-term unemployment remains unaltered, as only 3,500 people in this category found a [temporary, precarious, part-time] job in Q2. ‘Tis the season for field laborers and wait staff: the bulk of the reported new jobs were created in the agriculture and services sector (mainly tourism). 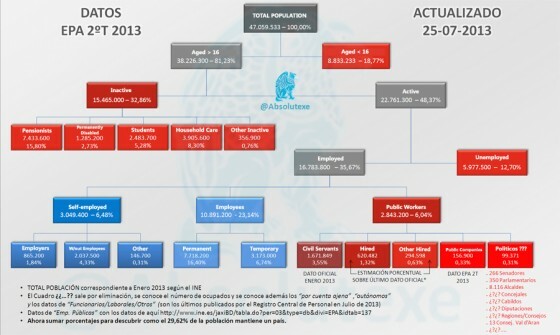 The following chart (courtesy of estadolimitado.com) illustrates Spain’s dramatic demographic structure. The bottom line is that 29.62 percent of the Spanish population (public workers not included) keeps the entire country afloat. While loaded Spanish trucks carrying industrial goods and subsidized agricultural products are yet to create a traffic problem in northern European highways, there is more to the story of Spain’s relative rise in exports, which ultimately are merely getting back to their pre-crisis trend. Given the continuing deteriorating domestic demand and high unemployment rate, the country’s trade balance would most certainly tell a different story under “normal” circumstances. Thus, the governments’ idea of raising productivity and incentivizing exports solely via fiscal devaluation will soon encounter its limitations. Perhaps the most positive development in the Spanish export sector is its penetration of new markets in Asia and Africa (while exports to the EU fall). In addition, the country must thank its Nordic visitors, (as well as British and Russians) for the country’s rising export figures. As Spain becomes a cheaper destination courtesy of wage deflation and northern Africa’s political instability, the historic number of foreign visitors registered last month (6.3 million) leads the tourism sector to brace for even more formidable figures this summer. Again, this partly explains the unemployment data discussed above. While certainly positive, it would be disingenuous to claim that an interim spike of visitors to a tourist destination deeply in need of renewal and investment will fix the economy. Not to mention that competing destinations such as Portugal, Greece, and even new euro-member Croatia, will also focus on tourism as key to economic prosperity. 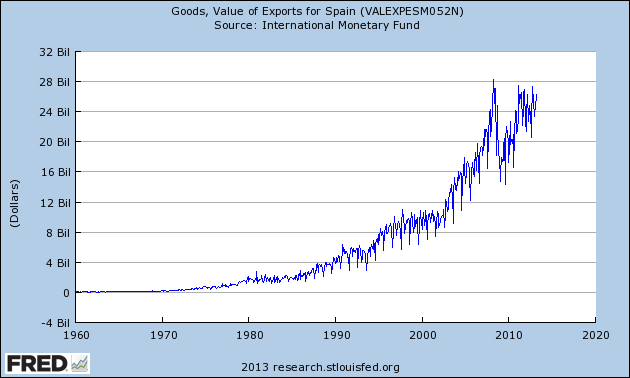 As for imports, the decline is sadly positive for a simple reason: Spaniards are broke. Here is where the sales pitch begins to turn embarrassing. Spain has shed nearly 10% of its public labor force (over 370,000 jobs) in a little over two years, and yet it still fails to control its government spending. Moreover, the government claims that the hardest part of the adjustment is over, and yet the country’s debt-to-GDP ratio has reached 90 percent and continues to climb. Then there are the ongoing structural reforms, which range from naïve to insulting. As confirmed by a study conducted by HR consulting company Adecco released today, Spain is the European country with the most independent workers in the services sector (56.7 percent). Such independent workers, however, are not necessarily entrepreneurs or their “own bosses,” as self-employment is commonly viewed. Increasingly, Spanish job seekers are required to register as self-employed in order to find work at shops, hotels, hair salons, etc., hence, allow business owners to save in Social Security fees and terminate contracts more easily as opposed to direct hiring. 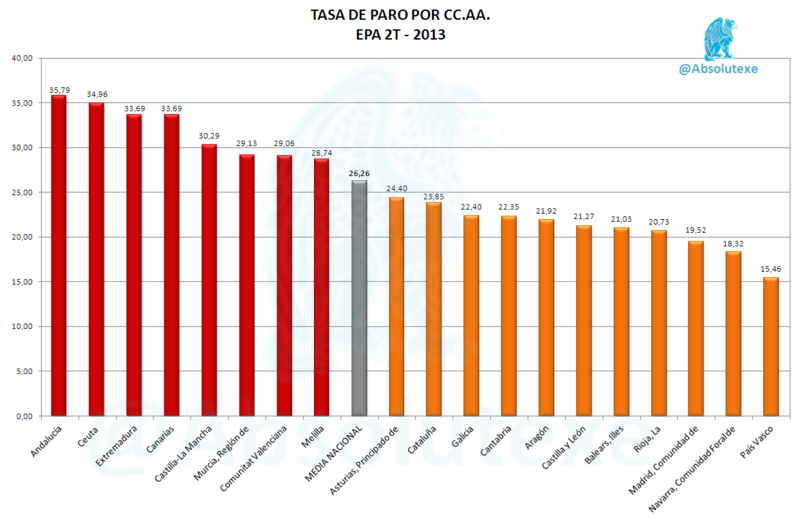 As per Adecco’s study, Spain emerges as the European country with the highest proportion of unskilled workers in its labor force (32.5 percent). This brings us to the Spanish government’s plan to boost self-employment and entrepreneurship. The plan centers on lowering the monthly Social Security Tax to €50 per month, for six months. Originally, this plan was aimed at the young, but the government has now decided to make it extensive to all unemployed. Some say Spain boasts the most-educated youth in its history. Perhaps the government believes such a highly educated youth also knows how to setup a profitable business in less than six months; without financing, that is, as the banking sector’s bad loans rate (11.3 percent) continues to rise. 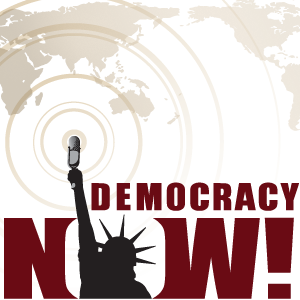 Most likely, the interim measure will merely help more unskilled labor find a temporary job. “Evil deeds in the name of patriotism” comes to mind when it comes to the Spanish government’s energy sector reform (the second this year). While Spanish households have suffered a 56% hike in their electricity bill over the past six years, to this date the government continues to defend a quasi-monopolistic model, from power generation to distribution. Instead of reforming and, while at the same time putting an end to the absurd nuclear moratorium (because the notion that the consequences of a nuclear disaster in France would never cross the Pyrenees remains childish), the government is continuing to raise the model’s unsustainable bill (i.e. the €26bn tariff deficit) on consumers and taxpayers. As opposition parties’ threat earlier this month to call a vote of no confidence for Prime Minister Mariano Rajoy forced the Spanish premier to schedule an appearance before parliament next Thursday to explain his party’s alleged illegal funding, there’s an evident effort to sell the story of a brighter future waiting just around the corner. In fact, Rajoy has already made it clear that he will focus his presentation on matters of the national economy, so we should expect more of these circular arguments, as well as a repeat of Vice president Soraya Sáenz de Santamaría’s ludicrous affirmation that proof of the country’s political stability is the fact that the Treasury is carrying bond sales successfully. 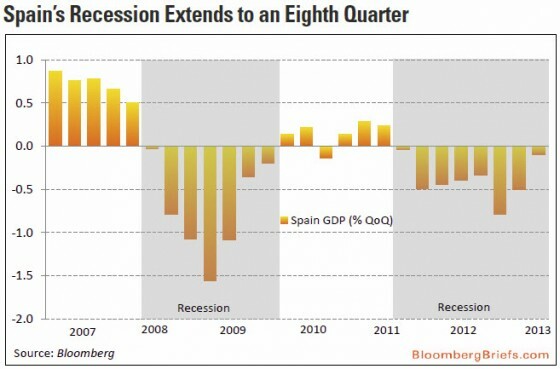 While the economy bottoms out and most jobs options continue to be cheap, low-qualified labor, the underlying story, and real tragedy, is that the country’s economic model remains unchanged and that high unemployment in Spain is to stay for years to come. I rather think of underemployment: people working ‘bits’ of their lives, a few months, sometimes a few weeks, sometimes in jobs below their qualifications, and most with partial contracts. And many, many moonlighters. Those who are highly competent will be seamlessly moving from project to project. Continuing advances in communications and crowd sourcing will favor these processes. But I think that structural unemployment will be very high and, if employment is continued to be measured in terms of ‘full-time employment”, the number of unemployed people will be permanently high. Yes, I think the implementation of a living allowance to cover the absolute minimum will be necessary, and that can take the form of food stamps…. Forget the celebrations. Call it a siesta. Esta obra se publica bajo la licencia de Creative Commons Attribution-NoDerivs 3.0 Unported.